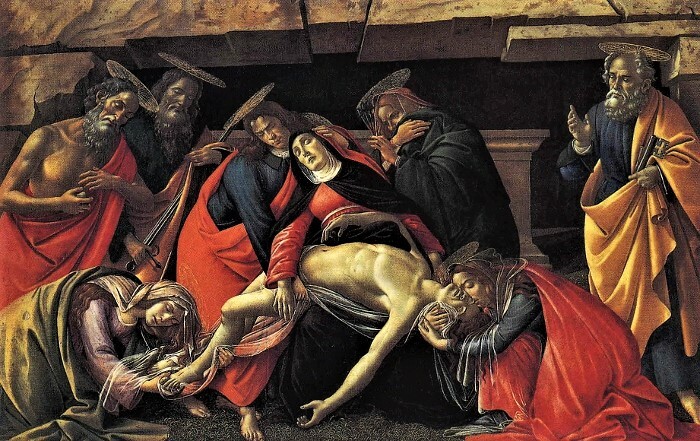 Sandro Botticelli was born in Florence in about 1445/46 under the birth name of Alessandro di Mariano di Vanni Filipepi - quite a mouthful - it is understandable that over the course of time that his Christian name, Alessandro, became shortened to Sandro. The name Botticelli, meaning Little Barrel, was the nickname of his well rounded older brother. The name was so familiar that eventually it was conferred upon every family member. With the exception of his work in the Sistine Chapel in Rome and brief excursions to nearby towns Sandro was to spend the rest of his life in the region, living in the same district the famous Vespucci family were his near neighbours. The merchant and explorer Amerigo Vespucci would eventually give his Christian name to the American continent. The well connected Vespucci family were among the artists most important patrons they also recommended Sandro to members of the powerful rulers of Florence, the Medici family. Details of Sandro's childhood and early life remain sparse. He grew up in Florence with his three brothers in the shadow of the monastery of Santa Maria Novella. His father, Mariano di Vanni was a tanner (the process of making leather) and lived with his wife Smeralda in the same district as the Vespucci family who became important patrons of the artists work. 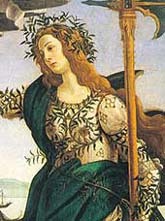 It is thought that Botticelli had been trained as a goldsmith by his brother Antonio. Most renaissance painters started their apprenticeships at the age of twelve or fourteen. Sandro's career as a painter started at the relatively late age of about eighteen when he was apprenticed to Fra Filippo Lippi a well respected Florentine artist. In Lippi's workshop, he would learn the techniques of composition and fresco painting in addition to the grinding and mixing of various paints. 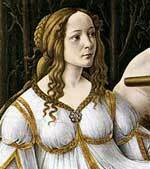 By 1470 Botticelli had his own workshop and became a member of the St Lukes Guild. His "Adoration of the Magi", painted in 1475, includes several of the Medici family within the picture and emphasises the importance of the Medici as patrons of the arts in Renaissance Italy. 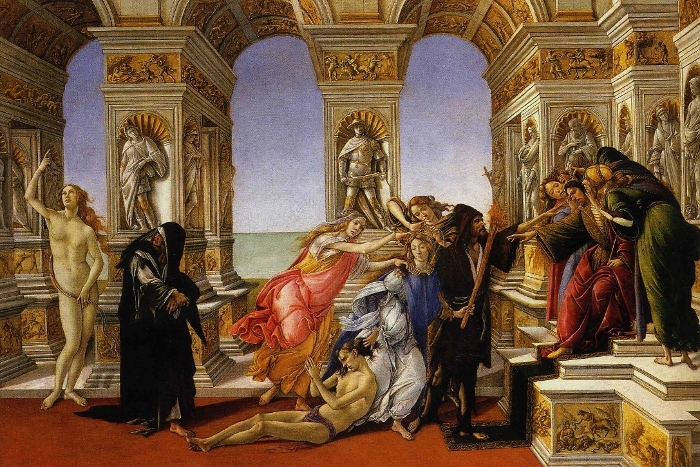 This is one of Botticelli's earliest works and clearly shows the influence of his master Fillipo Lippi. 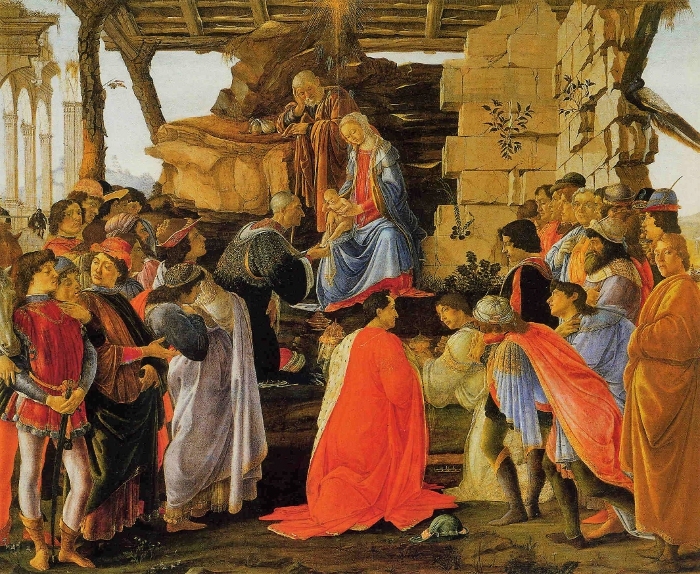 In this picture, the kneeling centre figure is Cosimo de' Medici and Botticelli himself stares out at the viewer, he is the figure in the yellow clothing on the right of the painting. As the artist's fame spread Botticelli was receiving more and more commissions from outside of the city of Florence. Pope Sixtus IV had summoned some of the greatest painters of the day to decorate the walls of the papal electoral chapel that bore his name, The Sistine Chapel. 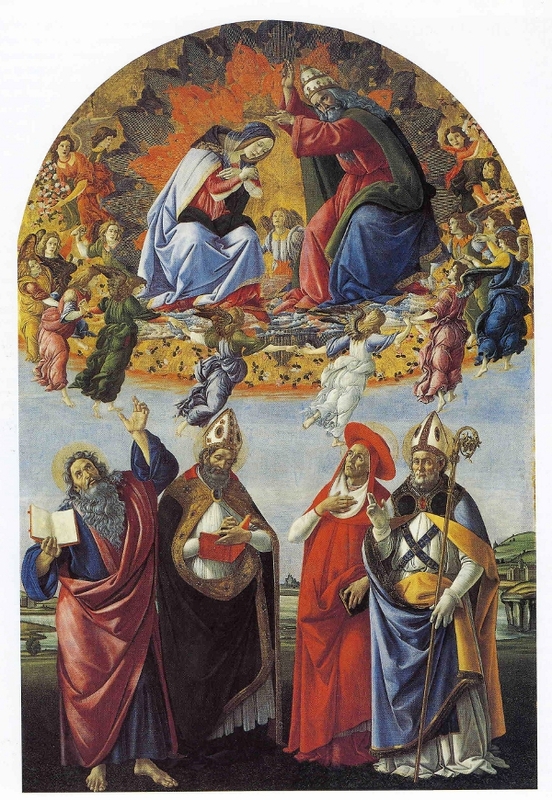 The artists included Pietro del Perugino, Domenico Ghirlandaio, Cosimo Rosselli and Botticelli. This was almost thirty years before Michelangelo's famous ceiling frescoes. So.... if you visit the Chapel don't just look up! Remember to inspect the walls. 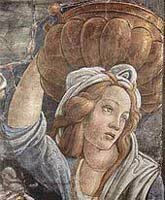 From 1481 to 1482 Botticelli worked on the decoration of the Chapel, his contribution was a series of frescoes on the left wall, "Events of the life of Moses" "The Temptation of Christ" and "The Punishment of Korah". He also worked on a printed version of the Inferno by Dante. Scenes of the Life of Moses, Sistine Chapel. 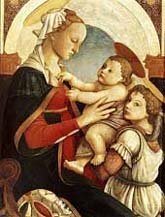 This picture was painted for the Vespucci family in 1483. It represents the victory of Venus, Goddess of Love, over Mars, God of War. After Sandro returned from Rome in 1482 he embarked on a series of mythological works. These paintings form the basis of Botticelli's present-day fame as an artist and are excellent examples of Renaissance artwork. They constitute some of the most discussed and familiar images in Renaissance art history and have a linear beauty that typifies this stage in the artist's career. "Primavera" is hailed as one of the artist's greatest works and dates from c1482. "Pallas Athene and the Centaur"
Another of Botticelli's mythological paintings, commissioned by the Medici family. Botticelli's most famous work is the much copied "Birth of Venus" 1485.This masterpiece was painted for the villa of Lorenzo Medici and is now in the Uffizi in Florence. 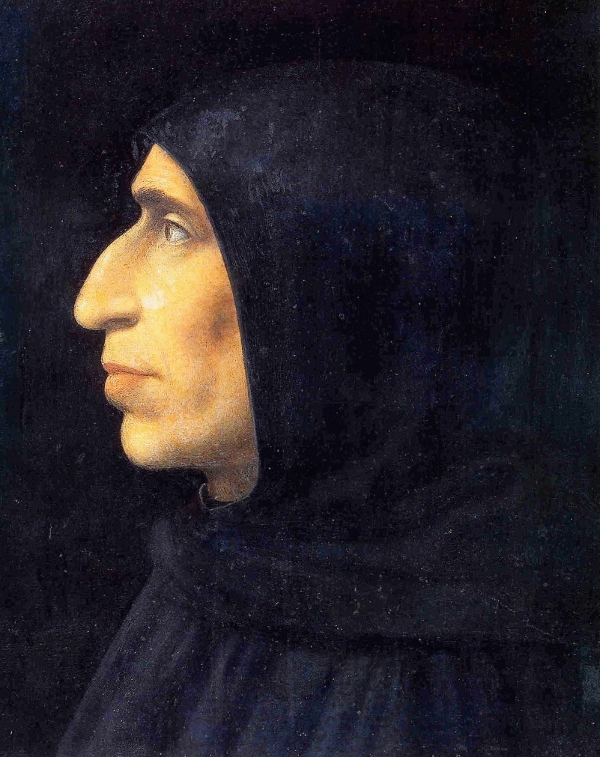 Botticelli fell under the influence of the radical Dominican preaching monk Savonarola a figure who exercised immense influence over the city of Florence. He became an ardent follower, and there is a story that he destroyed some of his paintings in Savonarola's notorious Bonfire of the Vanities on February 7th 1497, (the ritual of burning objects of sin, such as songs, books, manuscripts and artwork deemed to be immoral). Savonarola, after being condemned as a heretic and then excommunicated by Pope Alexander VI, was eventually strangled and burned to death in Florence on May 23rd 1498. The preaching monk Savonarola Painted by Fra Bortolommeo c. 1497. In this almost surrealistic picture, the Holly Family are painted on a larger scale than the other figures in the painting, a throwback to medieval works. The end of the century was a time of uncertainty filled with apocalyptic visions of the end of the world. 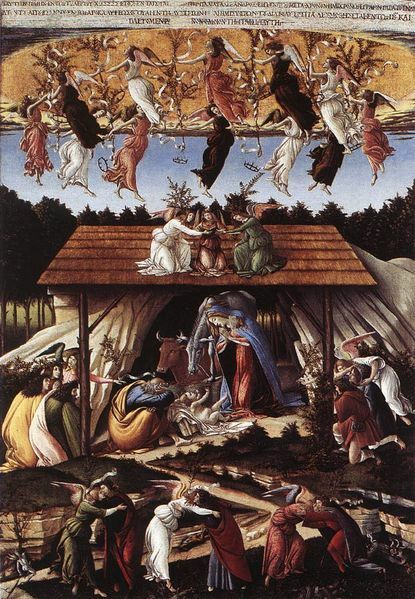 The Mystical Nativity highlights this paranoia with its images of saints and devils and dancing angels, a fragile mix of good and evil that epitomised renaissance Italy. In 1504 the artist was appointed to the committee to decide on a site for Michelangelo's statue of David, he had also served on the committee to decide the facade for the Cathedral in Florence. Apart from a brief revival in the middle of the 16th century when the Mannerist artists took inspiration from the linear elegance his work Botticelli’s paintings faded into virtual obscurity at an alarming rate. Thereafter he became a largely forgotten figure until the 19th-century revival of interest in the Renaissance gave him a fame that has endured to the present day. 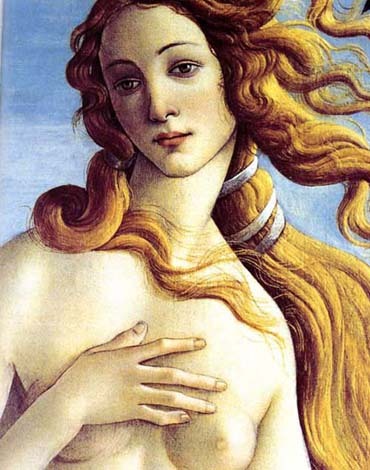 Sandro Botticelli died on May 17th 1510 in Florence and the details of the last part of his life remain a mystery. Vasari writes that the painter was ill and infirm, certainly, he received no commissions for paintings in his later years.